North Korea’s Nuclear Test of Hydrogen Bomb Causes 6.3 Earthquake – Coercion Code – "Dark Times are upon us"
North Korea has detonated a hydrogen bomb sparking a powerful 6.3 magnitude earthquake amid an ‘escalating’ nuclear crisis. 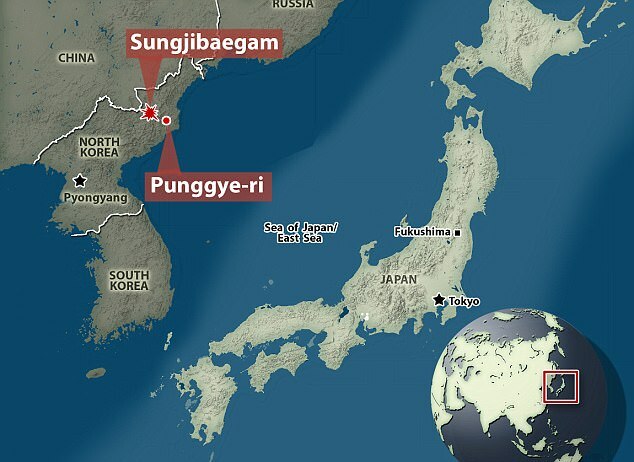 The terrifying tremor was detected in the northeast of the country where the Punggye-ri test site is located. State television claimed the country’s sixth nuclear test – 10 times more powerful than its fifth – was a ‘perfect success’ and could pave the way for a frightening new range of intercontinental ballistic missiles. It added that the hydrogen bomb test – which was directly ordered by leader Kim Jong-Un – was a ‘meaningful’ step in completing the country’s nuclear weapons programme. The blast – which was large enough to destroy an entire city – has sparked an international backlash with South Korea pledging to ‘completely’ isolate North Korea and deploy the most powerful US tactical weapons. US National Security Adviser HR McMaster has spoken to his South Korean counterpart in an emergency phone call following the test which is a direct challenge to Donald Trump. The American President had just hours earlier talked to Japanese Prime Minister Shinzo Abe about the ‘escalating’ nuclear crisis in the region. China’s foreign ministry added that it ‘resolutely opposes’ and ‘strongly condemns’ the test while urging the rogue state to return to the negotiation table. 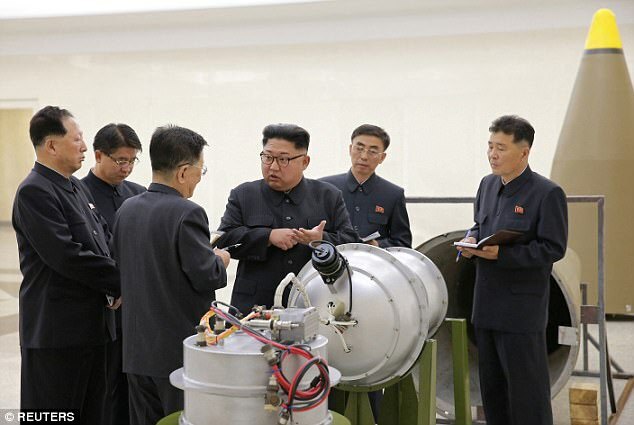 Photographs appearing to show Kim signing the order to carry out the test blast were also released today. The shock news was delivered on state television by anchor Ri Chun-hee – who has become the face of North Korean media after delivering major propaganda announcements from the rogue state for the past 40 years. Just hours earlier, the country claimed it had developed a more advanced nuclear weapon with ‘great destructive power’. Yonhap, South Korea’s official news agency, reports the quake struck where North Korea’s nuclear test site Punggyeri is located. September 9, 2016: Conducts fifth nuclear test, its most powerful to date. March 6, 2017: Fires four ballistic missiles in what it says is an exercise to hit US bases in Japan. March 7, 2017: US begins deploying THAAD missile defence system in South Korea. May 14, 2017: North Korea fires a ballistic missile which flies 700 kilometres before landing in the Sea of Japan. Analysts say it has an imputed range of 4,500 kilometres (2,800 miles) and brings Guam within reach. July 4, 2017: Test-fires a ballistic missile that analysts say brings Alaska within reach. Pyongyang later says it was a ‘landmark’ test of a Hwasong-14 intercontinental ballistic missile (ICBM). July 28, 2017: Launches an ICBM with a theoretical range of 10,000 kilometres, meaning it could hit much of the United States. August 26, 2017: Fires three short-range ballistic missiles. August 29, 2017: Fires ballistic missile over Japan and into the Pacific, acknowledging for the first time that it has done so. South Korea says it flew around 2,700 kilometres at a maximum altitude of about 550 kilometres. September 3, 2017: North Korea appears to carry out sixth nuclear test, with seismic monitors measuring an ‘explosion’ of 6.3 magnitude near its main test site. Japan’s government confirms a nuclear test has been carried out. The hydrogen bomb’s power is adjustable and can be detonated at high altitudes. The regime claimed it can build as many of the nuclear weapons as it wishes. The recent development comes amid heightened tension following Pyongyang’s test launch of two missiles in July that potentially could hit major mainland US cities. Also at the weekend, North Korea taunted world leaders, calling them ‘puppets’ and bragged that an attempt to locate and destroy its missiles was a ‘silly dream’. In the report about the new bomb Kim was seen inspecting, North Korea’s Korean Central News Agency added: ‘Kim Jong-un said he felt the pride at the indomitably bolstering up of [North Korea’s] nuclear forces despite a great price as he watched the Juche-oriented thermonuclear weapon with super explosive power made by our own efforts and technology. ‘He expressed great satisfaction over the fact that our scientists can do anything without fail if the party is determined to do. There will be some skepticism about the claim from experts about Pyongyang’s assertion that it has mastered hydrogen technology. Still, North Korea is increasingly putting leaders on edge as the isolated country continues to push its limits in regards to building up weaponry and firing off missiles.